HAPPY 20TH BIRTHDAY TO US! 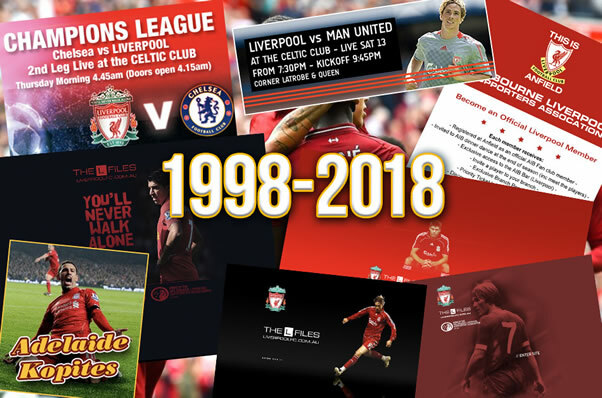 Hard to believe but yep, Liverpool Australia is 20 years old this year. Started as a little hobby back in 1998 by Wayne Psaila at it's old address of liverpool.senet.com.au, and quickly gained a cult following for it's quick up to date news service from around the globe. Fast forward 20 years later and there is so much to be proud of. Along the way the site has helped support local supporters groups (in particular the birth of the MLSA ala LFC Melbourne), with profile articles in MOTD, Four Four Two, Liverpoolfc.com, The Echo, a couple of FFDU Awards, a few domain name changes (had to hand back liverpoolfc.com.au back to the club) and involvement in 3 club pre-season tours down under. A huge thank you to everyone that has supported us down the years - especially Richard Cholewick who has worked continually behind the scenes for years. It's been such an incredible ride and we're looking forward even more to the future of our club and also continuing to support our local supporter community. Australia's No.1 LFC site is calling on all local Aussie & New Zealand writers out there. Local fans of our beloved club have a voice too and we want to hear what you have to say on all things Liverpool. Match reports and previews, opinion pieces, past glories ... you name it - we want it up on the site in big bright lights! So if you're good at writing then we want to hear from you. Email info@liverpoolaustralia.com.au with a bit about yourself and some examples of your previous articles. © 1998-2018. Liverpool Australia. All Rights Reserved. Site by Pinc.